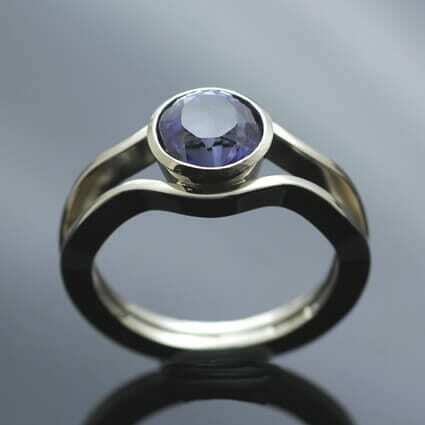 A stunning contemporary engagement ring designed and handcrafted by Julian Stephens Goldsmith, offering a truly unique, contemporary and custom made engagement ring for a lovely couple. Inspired by the ‘Ruscello Collection’ of contemporary, fluid engagement and wedding bands which playfully use negative space to create magical and modern ring designs this gorgeous cocktail ring is created using twin lines of wavy, undulating bands created from solid 14ct White Gold to complete this lovely design. 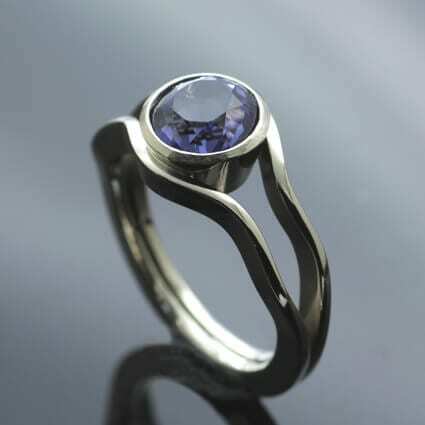 This sleek, modern cocktail or dress ring uses separate curvaceous lines of polished White Gold which flow softly around the finger, gathering in slow flowing waves to create a collet setting for an Iolite gemstone.